By any measure, 2013 was a great year to own stocks. It was also an exceptionally bad time to bet against the United States of America. And that remains the case as we open the page on 2014. From gold (down 28 percent) and bitcoins to most foreign currencies, the US dollar has laid waste to its rivals. The economic recovery that began in March 2009 has accelerated to levels not seen since the previous decade. Even the bitterly divided US government managed to reach a budget deal before provoking yet another crisis. The S&P 500 has returned better than 30 percent the past 12 months. And according to Wilshire Associates, the 56 new all-time highs reached in 2013 are second only to the 91 hit in 1995—a full five years before that bull market ended. Ironically, even as the market has climbed and the economy perked up, the appeal of doom and gloom has increased. In fact, selling America short is arguably as saleable an idea as it was so disastrously in March 2009, when this bull market began. That investment newsletter advertisers are peddling disaster scenarios is certainly no surprise to those of us in the industry. But a sizable portion of Wall Street is now preaching pessimism as well. And growing numbers of investors are trying their hand at the uniquely dangerous game of short selling. The spur is politics. When Barrack Obama entered the White House, the lines between political belief and portfolio management became hopelessly blurred for all too many investors. And despite the record gains materializing before their eyes, they remain convinced creeping socialism is inevitably pushing the economy and markets to a day of reckoning. That the US government will ultimately fail is basically an article of faith. The fearful consensus also assumes the Federal Reserve will “taper” too much or too little, igniting inflation, depression or both. It’s firmly convinced taxes and regulation will choke off growth, and that China will inevitably supplant an increasingly feeble and naïve US as the world’s leading economic power. For the fearful consensus, every “conventional” investment is to be avoided. That includes the humble regulated, investment grade, dividend-paying utility stock. Just weeks after credit rater Moody’s announced a likely across-the-board sector upgrade, supposedly reputable sources have proclaimed utilities in a “death spiral” due to combination of rising interest rates and rooftop solar installation. I’ve highlighted distributed generation in Conrad’s Utility Investor as a potential growth engine for power companies in the more sun-drenched areas of the country. My favorite play is charter portfolio member NRG Energy (NYSE: NRG), which is not only skilled in the technology but has a vast base of retail customers in unregulated markets like Texas to sell to. For all the hype surrounding rooftop’s potential, however, it’s had no impact on utility sales to date, even in obvious markets like Arizona and California. Moreover, Arizona has established the principle of utility fees on rooftop operators, to pay for maintaining the grid for everyone else. Meanwhile, the subsidies needed to make such distributed generation viable in less sunny regions are coming under attack as the equivalent of a costly new tax on business and consumers. In this, Europe has become more of a cautionary tale, rather than success story. Companies able to sign on creditworthy customers to long-term rooftop solar contracts—like NRG—will secure new utility-like income streams to power future dividends, as owners of utility-scale wind and solar generating facilities are now. But so far as growth goes, the rug could be pulled out from under the business at any time by government action. That’s a pretty good reason for caution when betting on the primary players. And it’s why extreme skepticism is called for when the suggestion is made rooftop will meaningfully change this sector, which has a 100-year-plus history of successfully absorbing all technological changes once perceived as threats. As for supposed interest rate sensitivity of utilities and other dividend paying fare, the Dow Jones Utility Average has returned nearly 12 percent for 2013, with just a few days left. That’s in a year when the benchmark 10-year Treasury yield rose from just 1.76 percent to over 3 percent. 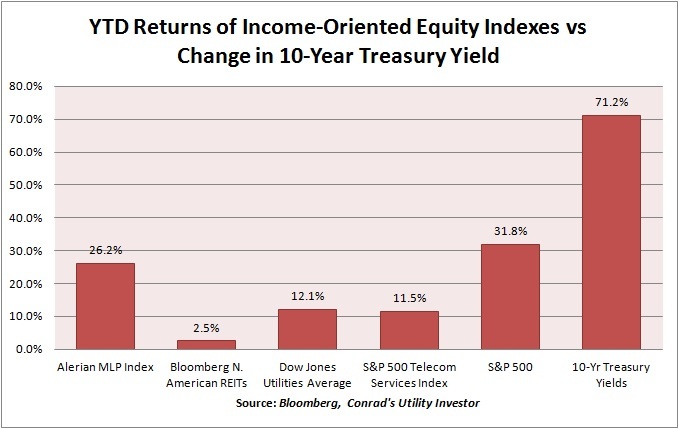 In other words, despite a 70 percent plus jump in interest rates, the so-called interest rate sensitive utility stock average has managed a double-digit total return! That simple fact should shatter forever the illusion that sector stocks are merely bond substitutes. Equally, a cursory look at the components of the DJUA reveals these companies don’t move in lockstep either. AES Corp (NYSE: AES), for example, has surged 35 percent year-to-date. The company’s US operations—including unregulated generation—contribute only about a third of overall earnings. The worst performer in the DJUA, Exelon Corp (NYSE: EXC), cut its dividend by 41 percent in February. The reason: Weakening wholesale electricity prices in the Northeast and Midwest US, in large part due to soft natural gas prices. Exelon derives more than half of its income from generating and selling electricity in these markets. In contrast, Consolidated Edison (NYSE: ED) purchases substantially all of the power it distributes to customers. Its fortunes depend squarely on how its treated by New York regulators. That’s been a dicey proposition in recent years under Governor Andrew Cuomo, and regulatory risk explains why Con Ed also underperformed the DJUA in 2013. Southern Company (NYSE: SO) is also hugely dependent on good treatment from regulators, though its monopoly extends to generation as well. It too underperformed the utility average, largely because of concerns regarding the remaining cost of building two new nuclear reactors in Georgia. Equally regulated NiSource (NYSE: NI), in contrast, has scored year-to-date returns close to 40 percent, as it’s become a target of takeover speculation. Despite this wide divergence in actual performance, the myth of a monolithic utility sector with values closely tied to bond yields persists. And after throwing in some scary sounding forecasts about solar power, it’s no wonder the fearful consensus is causing some to abandon long held positions in what have been exceptionally solid stocks over the years. Sadly, that’s a decision they’ll come to regret. Many will simply accept the nonexistent returns offered on cash equivalents in hopes of waiting out an unlikely Armageddon. Or worse, they’ll plow their money into riskier stocks that are Wall Street’s flavor of the month. Utility stocks, of course, have been pronounced prematurely dead more than a few times in their century-plus history–most famously and disastrously in the early 1980s by Business Week’s infamous cover article. That was also a time when it was fashionable to bet against America itself, a sentiment answered so forcefully then by President Ronald Reagan in his Morning in America speech. As President Reagan said then, the country had been through a very tough time, and there were certainly wide political divisions. But there were also unmistakable signs things were getting better. The President pointed to advances made in the private sector, often in spite of what the government was doing. That’s definitely food for thought for those mixing politics and portfolios, as we move into another year where political divisions seem unbridgeable, but much is definitely getting better. Take America’s emerging liberty from imported sources of energy. The shale revolution has already made the US a net exporter of light oil, as well as numerous refined products and natural gas liquids. Development of liquefied natural gas (LNG) export facilities is still several years off. But US gas exports are already flowing to Mexico, where a decrepit energy sector can no longer meet surging industrial demand. As my colleague Elliott Gue has pointed out in our Energy & Income Advisor, cheap energy is spurring a renaissance of American manufacturing as well, particularly in the South. US labor is much better paid than most of the world. But global and domestic companies are finding the cost more than offset by the advantages stable low-cost sources of power and gas, reasonable regulation and developed infrastructure. Despite years of carping from the fringes, the US dollar remains unchallenged as the world’s reserve currency. Information technology continues to drive business efficiency. Even a low-end iPhone has 240,000 times the computing power of Voyager 1, the exploratory, unmanned spacecraft launched in 1977 that recently left the Solar System. Back in the 1980s, the all-pervasive conventional wisdom was that Japan was destined to overtake the US as the world’s leading economic power. If you need a reminder, check out the 1993 movie Rising Sun this holiday season, or better read the well-written novel by Michael Crichton. Since that time, Japan has emerged as the world’s third largest economy by Gross Domestic Product. Its multinationals are household names everywhere and its citizens are among the wealthiest and best educated on the planet. Yet the idea of a Japanese worldwide takeover seems positively ludicrous—and the sentiments expressed by Rising Sun and other popular culture of the time remarkably quaint. China’s rapid growth of the past couple decades is perhaps even more impressive than that of post-war Japan. And the world’s most populous country now has the second largest economy by GDP. Yet, the fearful consensus’ conviction China is nearing a world takeover is almost certain to prove just as reality-free as paranoia about Japan has. That’s not just because the country’s GDP is still barely half that of the US. Nor is it because growth has slowed, it operates a managed currency, has an exploding wealth gap, is mired in a murky and tangled legal/regulatory system or has environmental problems that have already gone critical. Rather, it’s because as President Reagan also noted, nations that trade more are less likely to go to war, military or economic. Rising Japanese GDP never became a threat to US wealth and power, as American xenophobes maintained. Rather, it has enhanced it. And so long as China continues to grow, its progress will do the same. The upshot: We’re still looking at a glass that’s more than half full as we toast 2013 and get ready for 2014. In fact, the fearful consensus itself is proof that Wall Street is still climbing the proverbial wall of worry. That’s a necessary condition for a bull market already long in the tooth to continue. Long-lived bull markets, of course, carry far more danger than newborn ones. If the US economy continues to grow at a 3 percent plus annualized rate, it will raise a lot of boats, including companies that have struggled to stay afloat in recent years. However, if the screaming rise in the 10-year Treasury note yield does not moderate, it will eventually pull corporate and municipal bond yields up with it. Higher borrowing costs for state and local governments are likely to spur more municipal bond defaults in an already dangerous market, as I pointed out in the December 18 issue of Capitalist Times. That will almost surely cause trouble for many muni funds, which have loaded up heavily on risky credits like Puerto Rico to increase yields. As for higher corporate borrowing rates, the result is likely to be reduced investment and/or slower distribution growth. In early December, Kinder Morgan Inc (NYSE: KMI) announced lower-than-expected payout growth for 2014, though it also projected record capital spending for Kinder Morgan Energy Partners (NYSE: KMP). We may see more of the same reduced expectations for capital-intensive sectors going forward. The bottom line is a rising stock market is likely. But individual stock selection will be more important than ever for returns, even when it comes to betting on (or against) specific sectors. That’s what our team is focused on delivering in Capitalist Times, Conrad’s Utility Investor and Energy & Income Advisor. Here’s to the New Year! Roger S. Conrad is chief editor of Conrad’s Utility Investor. He co-founded Capitalist Times and Energy & Income Advisor with Elliott H. Gue.